Greetings again from the darkness. We all have two kinds of friends: those who sulk for days when the candy machine eats their quarter, and those with such zest for life that no personal or professional tragedy dampens their “can do” spirit. 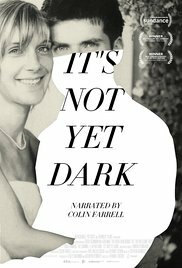 Director Frankie Fenton presents the remarkable story of Simon Fitzmaurice, an Irish writer and filmmaker who is robbed of his body by MND (Motor Neuron Disease). Fellow Irishman Colin Farrell narrates the film, giving poignancy to Simon’s own words … words he can no longer speak himself. As a writer and filmmaker, Simon’s “before” life is documented through pictures, videos and many of his thoughts on the page. He was a youngster full of ideas and energy. We learn this from his father Damien, his mother Florence, his younger sister Kate and childhood friend Phil. More than any other, we learn it from his wife Ruth. In fact, this is as much Ruth’s story as it is Simon’s. She is a special lady in love with a special man. Their story will likely resonate with you. It’s touching to hear Ruth describe how the hiring of a nurse allowed her to go back to being a wife and mother, rather than a care-giver. She and Simon even later had twins (kids #4 and 5), and he wrote a best-selling book/memoir on which this film is based. Last year the documentary GLEASON provided a similarly inspirational story about Steve Gleason, an NFL player stricken with ALS. These two films and these two men (and their wives) provide a sentimental, sincere and life-affirming message that life is worth fighting for and living to the fullest. This entry was posted on Thursday, August 3rd, 2017 at 8:12 pm and is filed under Documentary. You can follow any responses to this entry through the RSS 2.0 feed. You can leave a response, or trackback from your own site.